Here is the response we received from the owners of Siteam Leader. Unfortunately for them, we have photos that seem to contradict their report. Please accept our apology for very late reply to your email. On 14th of July 2010 the mt “Siteam Leader” was en route from Panama Canal to port destination Ulsan. The vessel was maintaining a course 279 and running with speed about 14.2knts, with moderate breeze and sea state moderate becoming rough. 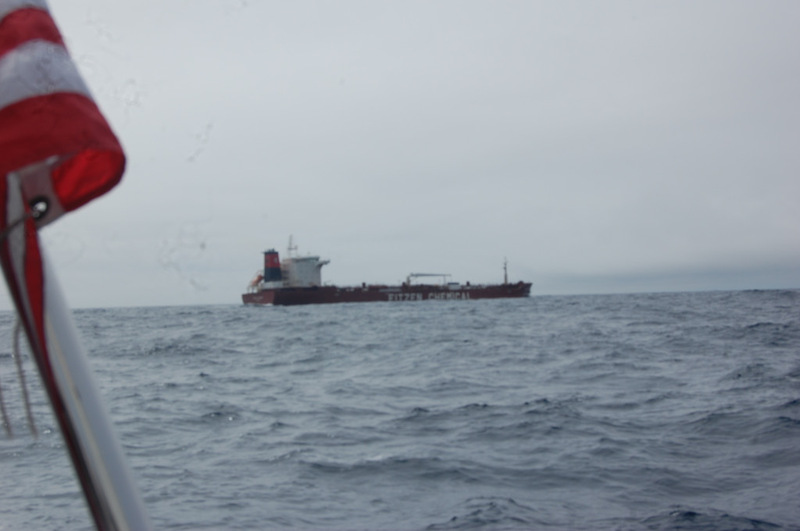 At 14:00 hrs LT the ship was in position 37 47.7N, 175 41.4E with the nearest coast being about 1200 nm away. About 14:30 LT on the starboard bow a small yacht was seen about 8-9 nm ahead, without any ID on ship’s AIS. The yacht was about 50-55 mtr long and was rolling and pitching in the moderate sea waves. Several attempts were made to reach the yacht by VHF radio but this was aborted as the yacht kept radio silence. By the time distance between ship and yacht was about 4-5 nm ahead on the starboard bow they were clearly visible through the binoculars. Nobody was visible on weather deck. The ships whistle was sounded and continued attempts to reach them by VHF was made without a positive result. contact had been unsuccessful and no one from yacht’s staff were visible on open deck. It gave the impression that the vessel was derelict or some trouble had happened on board. On this basis the ships course was changed to starboard about 10 degrees from original with intention to approach close with CPA about 1.5-2.0nm. confirmation that all was ok and for information there was one more yacht about 30nm away. Good luck and bon voyage was the wishes and about 15:20 hrs the vessel resumed on the original course and continued on route.